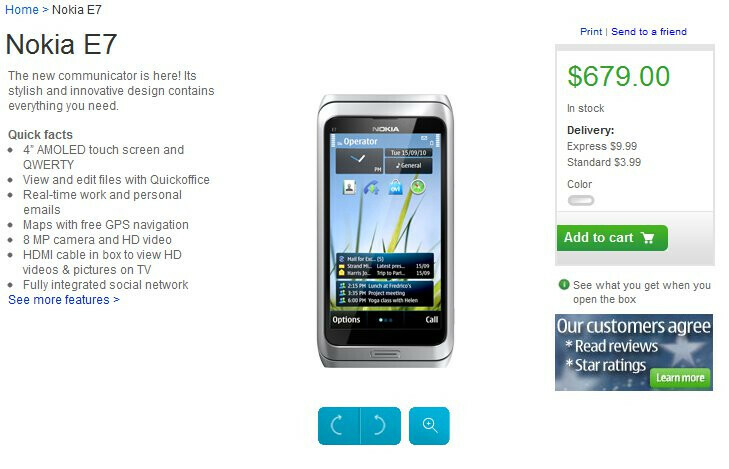 Even though T-Mobile customers will soon be able to snag a reasonably priced Nokia Astound in order to experience Symbian^3, other consumers in the US can actually pick up ab E7, Nokia’s flagship smartphone, starting today. The Nokia E7 is no doubt a looker thanks to its solid construction and premium choice of materials, but as it stands right now, it might seemingly follow in the same footsteps of other Nokia flagships. Specifically, it might not be able to muster up a following here stateside, and that’s partly because of the lack of any carrier offering. Again, you’ll need to head on over to Nokia’s online store and shell out a staggering $680 just to experience the very best from Nokia – which is regarded by some as being higher than the normal price. Honestly, it really is super pricey, but then again, that’s the price you’ll have to pay in order to show off such a rare device here in the US. 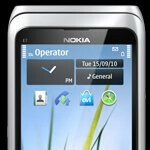 However, if you don’t care about the keyboard and just want to experience Symbian^3, your best option is to buy a Nokia Astound on-contract when it’s released. $680 is extremely over priced. The only selling points of this phone are the exceptional build quality, document editing, typical Nokia call quality and signal reception, 4" display, the slide out QWERTY, and if you're into it, Symbian. For the U.S. market, that's just not enough to warrant spending that much money. Phone needs to sit at $550-$575 max, with the N8 priced at $450. I understand that everything is priced high when it initially comes to the market, but I can't see that many people buying this up right now. I'll give it a month before they drop the price because they aren't selling any. If the price comes down enough eventually, I might pick one up and rock the E7 as my phone, and keep my N8 in my pocket as my camera. I miss having a keyboard. Intersting that you guys over the "pond" have this view about Nokia's being so expensive....the iPhone 4 in the UK is currently priced at £510 ($820) for the 16gb version and £612 ($985) for the 32gb.......expensive??? This isn't the UK. 95% of the population here looks at the price in terms of a 2 year agreement. The other 5% of us (me included) understand that phones purchased unlocked can get pretty expensive. It's not that we have a view of Nokia being expensive, but we look at what you get for paying that much compared to something else unlocked. The question for those people is; are you willing to shell out $700+ (tax + shipping) on a phone that is arguably not worth that cost based upon what you can get for less money? The N8, which costs over $100 less only forgoes the brilliant keyboard and 4" display, and adds in the best camera on the market. That's just one example. Compared to a Samsung Epic 4G from Sprint, off contract, which is $499.99, the only thing you gain is superior build quality, and maybe a better keyboard. But all that for $200 more? No way. It's not about being expensive. It's being expensive for what it offers (or doesn't). Network technology: GSM: 850, 900, 1800, 1900 UMTS: 850, 900, 1700/2100, 1900, 2100 So does it run ON T-MO or ATT??? It's pentaband. It runs every GSM frequency across the world. Can you believe that paying $680 and the shipping is not even free. Wow Nokia great device but really this thing is overpriced.